There is a great qualitative part called “Israel” (ISR-EL) in the general desire to receive. This part was founded by those who left ancient Babylon together with Abraham, who yearned for a connection with the upper force, in contrast to the other Babylonians. But the main thing is that they need this connection in order to be the conductors of the Light to the nations of the world (WORLD). Then it is said in the form of a fable that the Creator turned to the nations of the world and offered them the method of correction, but they were not able to accept its principles: not to murder, not to steal, etc. Indeed, our egoistic desires cannot fulfill the intention of bestowal by themselves and so they need a “head” that will give them the right intention. Thus the two parts of the general desire have to be together. They cannot be one without the other. First the part of Israel should be corrected, which means to have the right intention so that they will be ready to work with the desires. Then it will be possible to turn to the desires themselves, by correcting them by the intentions of bestowal. It is important to understand a couple of subtleties here: We already know that the corrected desires are different from the uncorrected ones in their intentions. The intentions depend on Israel. So there is nothing we can demand from the nations of the world; the correction is up to Israel and its connection with the world. After the destruction of the Temple and the shattering, Israel sank into the egoistic intention, and so it is for this reason that it has to correct itself first. Then they will only draw and add the desires of the nations of the world to the right intentions and then the correction is guaranteed. We have to focus and prepare for this moment: We operate consciously and we are aware of what we are doing, that the obligation of the correction is ours and we shouldn’t wait for the nations of the world to do something. Otherwise they won’t understand their dependence on Israel and will turn their demands and anger towards us. Clearly, this will only bring about disasters, since they are not corrected yet and cannot pressure us in any other way. It is Israel’s spiritual and corporeal obligation to hasten the correction as much as we can. We cannot depend on the nations of the world in any way if we don’t influence them correctly and don’t bring out intention closer to their intentions. On the whole it is a very simple schema, although it leads to many outcomes. 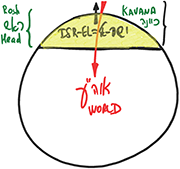 “Israel” means “I have a head – Li – Rosh.” Everything depends on the head of the Partzuf. The third and final phase is different from the first initial phase as humanity acquires a “head” while the other desires remain the same. So it turns out that the correction depends on Israel. The nations of the world who are the body of the Partzuf are seemingly waiting for Israel to be ready to give them their intention, to add the intentions of the “head” to the “body.” The body itself is passive and can only move in one direction. It can be much more clever than Israel with all the wisdoms in the world, but in itself it will not arrive at the idea of bestowal and so it cannot perform the correction. Therefore no one has a solution for the current crisis. Humanity will find itself totally helpless and things can deteriorate to riots, murders, and wars. Eventually, it will put enough pressure on Israel so that it will build the intention correctly and will present the rescue method to everyone: “Let’s connect and unite. Join us.” This should be done as soon as possible. To Reveal Or To Conceal? There is a well-known fable that describes the relationship between a person and the Creator. It is the fable about the guest and the host. After the host has set the table and put out all the refreshments for the guest, the guest feels great shame that simply burns him. He is ready to do anything as long as he doesn’t feel that shame. Then the host, feeling pity for the guest, creates concealment. But what does he conceal? If the host just conceals himself, the guest will comfortably eat all the refreshments on the table and that will be the end. The guest will remain an unfeeling egoist that only knows how to receive and will go on existing only in the corporeal form totally detached from the host. So it turns out that the concealment of the host alone is not enough. The pleasures should also be concealed and then played with by revealing them to the extent that the guest can repay the host with the same attitude that the host reveals to the guest in small portions. All these three components: the pleasure, the feeling of the host, and the guest’s appetite should be revealed gradually and all three should be compatible to one another. Then the right conditions should be created for the guest in small portions, in which he will be able to establish the same attitude towards the Creator, with the same love that the Creator treats him. How is that possible? The smallest degree on which the host reveals the pleasure in the refreshments and shows his attitude towards the guest is a great degree for the guest. This is because for him it is a new life, which he didn’t feel in the concealment. He should develop in him the readiness to treat the host this way in advance, just as the host treats him on the very first level. When the flavors of the refreshments are revealed, the guest will not have to deal with them, but will use them as a means: to receive them and build his love for the host above them. So it turns out that the restriction and the Masach (screen) have to precede the revelation of the Light, the Creator. This means that first and foremost we need the fear of the Creator. A person must develop this attribute: awe, fear of not succeeding to bestow upon the Creator, constant worry about that; what if the Creator is suddenly revealed and I am not protected from the egoistic pleasure and will not be able to love Him back? The necessary preparation for the revelation of the Creator is in this fear. This awe is on all the levels, but in different forms and in different intensity, but the awe is an essential condition. If a person acquires it, he is ready for the revelation of the Creator. We are on the level of preparation for the spiritual world called “this world.” In our state today, on this level, there are all the necessary conditions to stabilize in us the true spiritual fear that is the first commandment. It isn’t the kind of fear we feel in this world, it isn’t worries and corporeal fears a person is full of, as he constantly worries that something may happen to him, worrying about the past and the future, about what will happen to him and to those who are dear to him. We are constantly living in this animal fear, and although in most cases we don’t perceive that. It is fear that guides us every moment of our life. But I have to restrict this corporeal fear and to build upon it the right fear—whether I can bestow upon the Creator, whether I will reveal His goodness and His love! If instead of the corporeal fear I build a spiritual fear inside me, I will thus correct my desire. This world was created for that purpose in order to exert one’s self in it and to move from corporeal fears to a spiritual fear. There is no shortage of corporeal fear; a person constantly fears something. This is our corporeal existence: in constant fear that I won’t lack anything, that I can feed myself, that I won’t be harmed, that my pride and honor will not be hurt. All my corporeal senses operate on fear, on keeping my personal boundaries, so that no one will be able to invade them. Our work, however, is the opposite: It is about breaking our boundaries outwardly, opening ourselves and incorporating in others! Thus we break the boundaries that fear depicts for us. The boundaries of fear depict my image for me, my body. Then comes the next circle of fear, which depicts everything I see around me: my relatives, my home, and then more and more external circles. This whole picture is depicted to me by fear, and it is only on this basis that my senses work. If the environment gives me the power and the yearning to exit myself, I will begin to feel how good it is to be outside my egoistic boundaries. Then I will use the power of the environment in order to restrict my corporeal fear and will acquire a true fear, the fear of the Creator, of worrying only about whether I can bestow upon Him and whether He will be revealed to me as the one who bestows upon me. If I worry only about this one true fear, the Creator will give me the Masach (screen) and will reveal Himself before me. Together We Shall Turn The Night Into Day! Question: How can we use the group to attain the demand to acquire trepidation before the Creator? Answer: First I need to work though all of my original qualities in the group: hatred of my friends, rejection, care for myself, envy, ambition, and all the other problems. All these qualities must become more distinct and obvious so it would become clear to me that I am deep in my egoism. I must recognize my evil. But this entire evaluation happens precisely when I aspire towards goodness. I must aspire to reveal the love my friends feel towards me so it would soften my heart and give me the desire to search for connections in a material form. Then I will begin to feel like a passionate and powerful energy that is not of this world but becomes revealed inside a more inner connection with my friends—an unusual power and warmth, a special connection. And this connection does not depend on us, on what we are doing now, and where we are with our feelings and mind at the given moment. This is something that is always present and connects us, and which absolutely does not depend on us. There are certain invisible iron rods, which connect us all. Due to the fact that I feel this connection between all the hearts, I reveal our belonging to one another. This necessary feeling is there to begin to develop a certain resistance against our narrow egoism. Question: The newspaper Haaretz published data on the psychological status of adolescents and young adults: 18.5% consider suicide. How can we respond to this? Answer: The educational system does not bring them up, but only gives knowledge; the healthcare system is concerned not about patients, but about selling drugs, and so on. Our egoism has developed and turned into a cancerous tumor that is killing humanity. People do not have an answer to the question about the meaning of suffering and the meaning of life in general. Religion does not soothe the developed egoism and has outlived itself; a person wants not only to hear and believe, but also to see and feel. This can be accomplished only through Kabbalah—the method of revealing the higher force of Nature (the Creator), its goal, and the management program during a man’s life in this world. We should quickly reveal this method to the world, and not only will suicide disappear, but the entire attitude of a person towards his existence will change to be positive and rational. There is NO other solution to the crisis and its particular manifestations! In order to get the real and complete picture of reality, we need to disconnect somewhat from that same reality that we are used to, and as much as possible, to try to imagine the permanent state which is the desire to receive that was created by the Creator. All movements take place only within this desire, within its consciousness. If this desire tries to understand and feel its real state, then this is called movement. It is precisely in this state that we find ourselves, but in our understanding and feelings we grasp a different, imaginary reality. This kind of exercise, a game in which we are involved in order to make an effort, like children, trying to succeed in the game, and through this to gain knowledge, feeling, understanding, intelligence and development. If not for these games, then the child would grow up like a beast: from a small beast into a large beast. But it is specifically through the games that each time he learns, changes, and becomes a man. And here we are, exactly in the same state. On purpose, He gave us a feeling that is far from the truth so that we would try to resemble the truth, like small children who play at being grownups. To the extent of our attempts, we begin to grasp this real situation, enter it, and feel that we are within it. It turns out that the wisdom of Kabbalah is comprised of advice about how to attain this real state, which laws operate there, what activities occur, and what we can do in order to gradually pass from our present state to a state that is more advanced through these actions, thoughts, and desires. All of this is called the work of the Creator, since through it, we want to resemble the Creator. The Creator is the general force, the general desire, attribute. And in order to resemble this attribute, which is called the Creator, we must create within us conditions to reveal Him. This is specifically what we do step by step with the help of the advice of the Kabbalists. Our gradual corrections are completely contradictory and opposed to bestowal, until complete resemblance to it, which is called the spiritual ladder, where we rise from the attributes of reception to the attributes of bestowal. In these ascending levels, we learn about the spiritual acts, the understanding of the attribute of bestowal in all forms. The correction of these egotistic attributes to attributes of bestowal is called fulfilling Mitzvot (commandments/precepts). Question: In the past, in Ukrainian villages, they would build a house in one day. All the villagers would come together and build it. Is it possible in a Kabbalist group, when people would gather and give all their strength and all their energy in order to help others in some way? Answer: I think that now the Creator will bring us to this. He will invite very big changes in the economy. Masses of people will become unemployed. They will understand that in order to survive, they will need to unite and in this way will find a correct system for connection and unity. With our help, they will find it, and specifically in this form they will exist, doing everything together. But since this will already be unity at a higher level, it will feed everyone with enormous energy. Baal HaSulam writes about this in the book The Last Generation. Thus, I think, that we are approaching this. Or through our dissemination and consciousness, or via big blows, in any case, humanity will quickly discover that without the correct connection and unity, including the previous studying, education, and knowledge, it will be impossible to do anything. This is what we see today in Europe. They wanted to connect between them without any inner preparation, and now are separating. And this was a great problem for them. These were normal blows: Everything will fall; everything will collapse just to show people the necessity of unity. The movement itself is correct, only not in the capitalistic ideology where each one takes for oneself all that he can, but a different ideology. Thus, we will be building together. Question: In lectures for the 99% can I use the examples of threats of war, famine, and crisis? To what extent can we use them? Answer: You should not use examples in this form. You just need to show the development of the world and where it is heading and to do this in a scientific way, explaining that in accordance with the development of our egoism, there may be some problems, etc. The crisis will not pass on its own; we have to correct it in ourselves: This is the crisis of relations between people, not a financial, economic, or environmental crisis. That is, nature is against us, and we are its ever-growing opponents. We need to show people where it is heading from a scientific point of view, without feelings. Of course, all this leads to wars and big problems if we do not step in and begin to move the world towards balance. We are able to solve this problem. Question: Why do the masses need to work in the group when we can just give them a book where everything is explained? Answer: Where will people create the Kli, vessel, where they will begin to experience higher energy? They need practice! Even if they have nothing to do with Kabbalah, they still need to feel that unity has a special power by which they can change the world, transform everything around them, and see everything deeper. With the help of this force, the property of bestowal, they begin to see as if with X-ray vision into history, into matter. They rise above time, space, and motion to the next dimension. If they do not practice with each other and only read it while lying on a couch, then nothing will change. Reading is good for training, to “warm up,” but not for realization. Question: Should physical meetings be mandatory? Answer: Yes, it has been practiced by Kabbalists from time immemorial because contact between people, here, in person is required; you have to implement this. The Creator is not manifested in one person; He will manifest Himself only in the contact between people. Therefore in addition to you, there must be at least one more person. But it is difficult to work with two people. A group of ten is ideal.